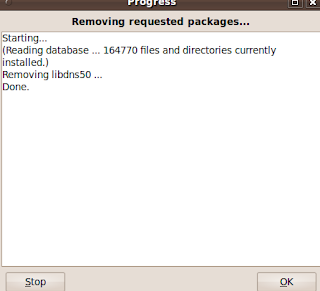 The gtk orphan package present in the repositories of ubuntu can be conveniently used to clean up your system. It allows you to graphically select and remove packages that are no longer used. 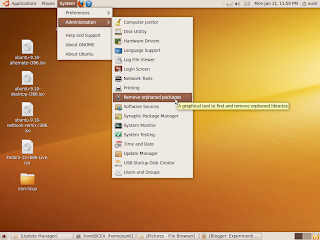 On Ubuntu 9.10.Install gtkorphan as below. A new menu entry will show up as System-Administration->Remove Orphaned packages. 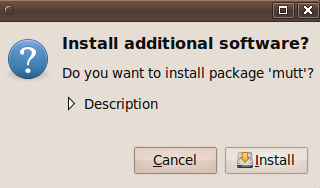 Select the orphaned package you want to remove and click ok. Finally, you will get the following screen. 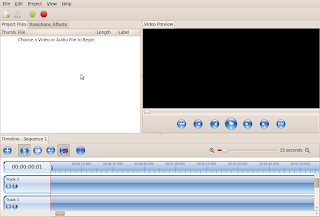 Open shot is a non linear video editor for linux built around python , GTK and MLT frame work. Open shot 1.0 was recently released. 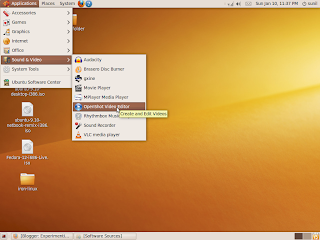 This tutorial explains how to install it on Ubuntu 9.10. On your Ubuntu computer, open System > Administration > Software Sources. .
Click the Other Software tab and then Click the Add button. Type in the following line and Click on add source button. When prompted, reload the software sources information. You may see a warning about unverified software sources; we're going to fix that next. Open your terminal and enter the following commands. The above command will import the apt key . Openshot will show up at Applications->Sound and Video->Openshot. You can try editing a video. The chrome browser from google is a fantastic product. It is fast , reliable and multi platform. However, privacy advocates are concerned about some data that chrome sends to google while we are browsing. SRware, a German company has recently released a recompiled version of chrome named Iron to address the privacy concerns. The important differences between iron and chrome are listed here. You can try out Iron on Ubuntu. Click here for down loading the tar.gz file. Unzip the file like this. The file will be unzipped to a folder name iron-linux . You can click on the iron binary inside this folder to launch iron. Or you can add the folder to the PATH environment variable and launch iron from the command line. You can create an ad-hoc wireless network between 2 linux hosts as shown below. Let us assume that we have two machine A and B both running ubuntu. We will assign 192.168.1.1 to A and 192.168.1.2 to B. I am also assuming that the drivers for the wireless card ( wlan0 here) are loaded already. Please note that essid and key must be same on both machines. You can change the given values. All most all unix/linux shells support a feature called aliasing. Using this feature you can shorten a complicated command with several options to a handy one. 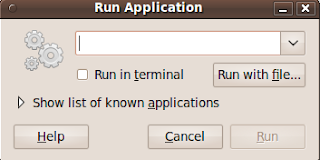 For example open a terminal and type in the following. Now typing l at the $ prompt will execute the  command ls -l .
Similarly you can alias any  command. 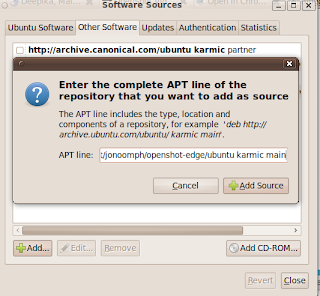 On ubuntu , you can install a package quickly using apt as shown below. The following pop will come. 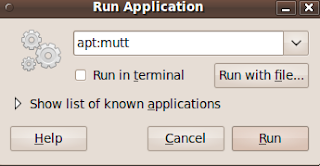 Type apt:mutt in the window as shown. The following pop up will come. You can press install and the rest of the procedure is same as package install from synaptic.